TULSA, Okla. (June 21, 2018) – The Tulsa Zoo is celebrating World Giraffe Day by putting the finishing touches on an expanded giraffe barn, just in time for an expanded herd. Eleven-year-old Rothschild giraffe Lexi is expecting. Dad is 4-year-old Hekaya, who was born at the Bronx Zoo in 2014. The barn rebuilding was made possible thanks to the generosity of Osage Casino Hotel, which provided the sponsorship necessary to allow the zoo to more than double the indoor space, add year-round viewing and make improvements required for a multigenerational herd, says President and CEO Terrie Correll, Tulsa Zoo Management, Inc. The expanded barn will feature new stalls, natural substrate and a large community space. Wider doors and adjustable feeders will allow the barn to better accommodate a variety of giraffe heights and sizes. 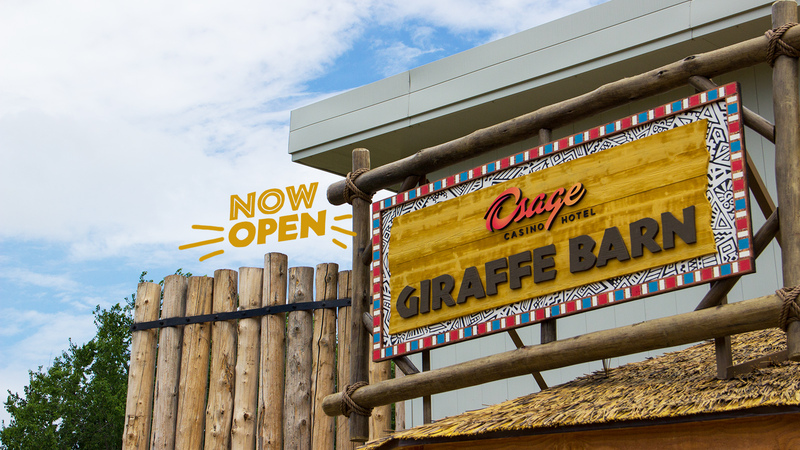 The Osage Casino Hotel Giraffe Barn is an example of the Tulsa Zoo’s direction in animal exhibits and commitment to seek ways to do more for the animals in zoo care. “The Osage Casino Hotel Giraffe Barn will allow for increased space and amenities for the animals, the staff and the guests. It embodies our commitment to current and future giraffes by providing the best opportunities for them to thrive at our facility,” Correll says. The new Osage Casino Hotel Giraffe Barn now is open to public viewing. The zoo shifted construction schedules to focus on those areas most important to support Lexi’s delivery and introduction of a calf to the habitat. Giraffes have among the longest gestation periods of all mammals, at approximately 15 months. Zoo staff has been carefully monitoring Lexi’s progress for more than a year and estimates a delivery date from now to early August. Male giraffe Hekaya joined the zoo in 2016 from the Bronx Zoo in New York. Female giraffes Lexi and Pili are 11 and 9, respectively, and joined the zoo in 2011 from Dickerson Park Zoo in Springfield, Missouri and the Sedgwick County Zoo in Wichita, Kansas, respectively.